Over the weekend, state Rep. Jack Drake (R-Griswold), 81, passed away at Cass County Hospital in Atlantic. 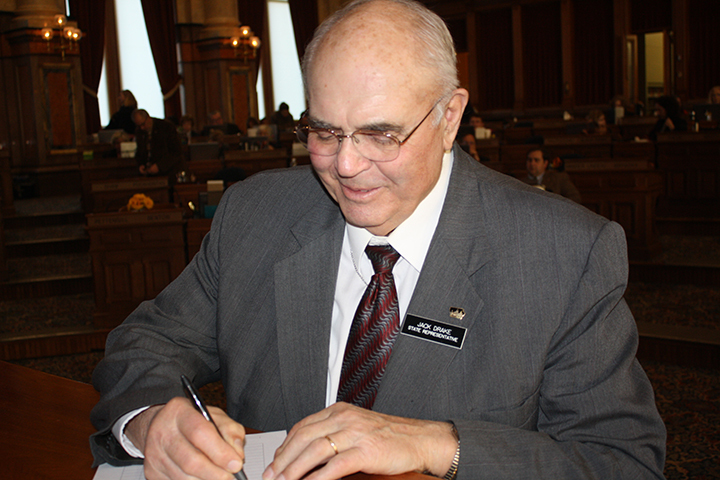 He had served in the Iowa General Assembly for nearly 23 years. Drake was serving his 12th term in the Iowa House of Representatives. Republican Party of Iowa chairman Jeff Kaufmann, who served with Drake in the Iowa House for a number of years, was the first member of Iowa GOP leadership to respond to the news of his passing. Gov. Terry Branstad and Lt. Gov. Kim Reynolds each responded to the news on Monday afternoon. Drake won his first term in the Iowa House in the 1992 General Election, ending Jack Hatch’s first term of service in the Iowa General Assembly. He served on the House Agriculture, Appropriations, and State Government committees and was chairman of the Agriculture and Natural Resources subcommittee. Drake represented House District 21, which includes parts of Pottawattamie and Cass counties and all of Adams and Union county. House District 21 includes the cities of Afton, Arispe Atlantic, Corning, Creston, Cumberland, Griswold, Lorimor, Massena and Nodaway. Branstad will set a date for a special election for House District 21 at a later date. According to the funeral home death notice, Drake was born near Walnut, graduated from Atlantic High School, and attended the University of Iowa. He was a farmer, and very active in local and state organizations, including the Walnut Telephone Company, the Iowa Cattlemen’s Association, Iowa Farm Bureau, and the Iowa Corn Growers Association. He also was a former Board Member of the Pottawattamie County Zoning Board; the former President of the East Pottawattamie County Farm Bureau; and the former President of the Pottawattamie County Extension Council. Jack was active in 4-H and served as a leader of the organization at one time. The Duhn Funeral Home in Griswold says services will be held Thursday at 10:30 a.m. at the Griswold United Methodist Church. Interment will be held at the Griswold Cemetery. Visitation with family will be from 4:30 p.m. to 7:30 p.m. Wednesday at the church. Drake is survived by his wife Shirley, two sons, two daughters, 11 grandchildren, and 11 great-grandchildren.